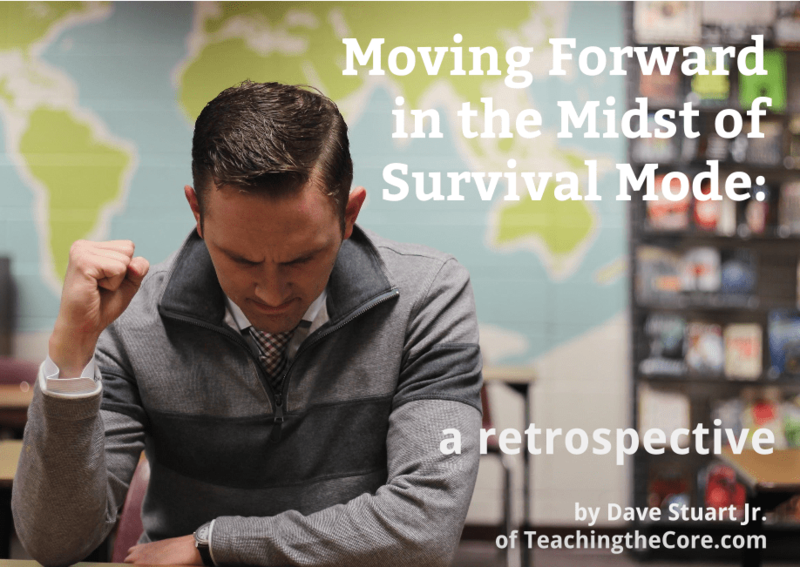 Moving Forward in the Midst of Survival Mode: A Retrospective - Dave Stuart Jr.
You've commented on this past month's blog posts like never before. Hearing your stories, your encouragement, your descriptions of what this blog does for you — I can honestly say that there has not been a month yet when being a teacher-writer has felt more rewarding than this past one. You've supported my latest book project, Never Finished. The book has sold 288 copies at the time of this writing, and while that's not much for the big dogs (one of my heroes, Don Miller, just released his latest book; 10,000 copies sold before the release date! ), it means so much to me. Part of me was like, “Dude, don't publish that sales number; it makes you look lame; publishers will never pick up Never Finished if you do that,” but then I was like, “Seriously, Part-of-Me? That's what you're about?” We're talking about 288 people (and counting! Growth mindset, right?) that are important to me because their feedback will help make that book better and better as this year progresses. So far, they're saying it's a helpful book. When life torpedoes our work schedules, how do we continue progressing toward our professional goals while remaining true to our life priorities? First and most pragmatically, it is simply not necessary to sacrifice one's personal life in order to promote the long-term flourishing of our students. Putting all our time into this job does not inherently mean doing it better. On a deeper level, though, we simply owe our families more than we owe our students. When I married Crystal, I made a vow to her to love her unconditionally, daily, and with multitudinous acts of love. I've made no like vows to my students. Teaching is a calling with which I am in love; it is not, however, a calling of equal importance as that of being a faithful husband to Crystal (faithfulness, by the way, is much more in my book than refraining from adultery). A similar thing is true with children. I, like almost every teacher in the world, view my students as my kids. I try to treat them and teach them like I would want a teacher to do toward my own kids. Yet there will only ever be one biological, my-genes-are-in-them dad to Hadassah, Laura, and Marlena. Just one. That is me. Teachers — of all people — should never neglect their children; we see, every single day, the effects of subpar parenting. To end on a more pragmatic note, consider this: the burnt-out teacher cannot bring as much energy and creativity and vigor to the work as the balanced one. We must have time in which we take the teacher hat off and be more than teachers. That time is called our personal life. With all of these things, hear me: teaching is such a noble profession. The nobility of our work makes me speechless; I pray I'll never communicate otherwise. Yet it is exactly because of that that we must not make success in our work a worshipped thing, sought with every waking minute. Here I'll stress that, while this past month was difficult for my family and me, I in no way equate it with anything approaching tragedy. My wife has recovered; my children are okay. All is well. If you're currently in the middle of a season that makes the one I just went through seem like a picnic with puppies and unicorns, please hear me: my sympathy is with you. I didn't write two posts per week. I didn't release Never Finished on time. I didn't put enough prep into two days of instruction filmed by good people from Relay Graduate School of Education. I didn't give students quick enough feedback on their work. I didn't create a new First Day of School lesson that I had planned for my new students at the start of Semester Two. I didn't include the essay on my world history exam; I wanted to, even though it wasn't part of the district curriculum, but it fell through the cracks. I didn't create the goal sheets I wanted my students to experiment with during Semester Two. I didn't create the warm-up sheets that better align with our district's new evaluation model. You know me — glass half full, right? I like learning from failure and moving on quickly with lessons learned. “Fail forward,” I read recently. Yes. So while some of those “didn't get done” things in the previous section were the result of failure, many of them were actually wins because I intentionally chose to drop them. For example, not giving the essay on the exam was the right call. I was adding that essay by my own druthers. It was one way in which I wanted my students to Do Hard Things. Did my students lose out on an opportunity there? Yes. Will it make or break them in the long-term? I don't think so. I wrote five posts for Teaching the Core (see them all here), making it one of my more productive months in the life of the blog. That's awesome because it was a hard month and I still showed up and did the work. I submitted a second round Character Lab Teacher Innovator grant application. I'm not a grant-writing pro, so this was highly challenging for me; it required hours of research and lots of notes taped around my kitchen for a few days. Yet the work was so worth it no matter what the selection committee decides. That's how powerful the writing process was for me in terms of clarifying (for me, and that means eventually for readers of this blog) interplay between character strength development and pop-up debate. I led two full-day literacy PD workshops — one in Dearborn, MI, and one in Turlock, CA. I went through the nerve-wracking process of being filmed for two days by the Relay Graduate School of Education. I say nerve-wracking because I was so nervous before they came in. Every Never Finished teacher knows their shortcomings better than anyone else; I was no exception! I released Never Finished — late, yes, but I still got it out. I spent a day walking around San Francisco with my wife (she came with me to the Turlock professional development engagement); we watched the sun set over the Pacific Ocean while drinking some wine on a beach. In January. For a Michigan person, you might as well transport me to Mars. While that might seem like a lot, I chalk it up to a few key factors. I'll close the post by sharing them. Meals came to our house. Grandparents, aunts, and friends from church babysat our children. These might seem small, but they were enormous; they gave hours and hours of time that I wouldn't otherwise have had. I owe these people greatly. Here's the takeaway: be open to the help of others. I've had to grow into a man who can say, “Yes, thank you,” when someone offers help. Teachers too often are fiercely independent. Resist that in yourself, especially in hard times. 2. If a task will only take two minutes, do it now. If you have a task on your to-do list that will take less than two minutes to complete, do it right now. Pwn it. I allude to this in my work schedule post; there, I have parts of my day in which I allow bite-sized tasks. Here's the takeaway: During times in your day that are already prone to interruption (if that's all times in your day, you need to get better at hiding), annihilate two-minute tasks — you have way more of them than you think. That huge email from a parent? Respond in two minutes. The one kid who told you his grade is messed up? Two minutes. Picking those things up from the printer? Etc. 3. Have some projects without firm deadlines? Delay them. While I did accomplish a lot in January, notice how much I didn't accomplish. When things go wrong and your working hours take a huge hit, it's time to triage. What must get done by a certain deadline and can't be moved? The Character Lab app, on the other hand, wasn't going to move. If I was going to apply, it had to be on time or not at all. Those instructional pieces that I didn't do — the essay, the first day lesson, the warm-up sheets, the goals sheets — those are all things I think will improve my outcomes with students, but at the end of the day, the systems and assignments I currently have in place are helping my students. I suspect my ideas will help students more, but my ideas, in these cases, aren't time critical. On the other hand, releasing Never Finished last month, I feared, was critical if it was going to get out at all. My perfectionism imp was hammering at me every time I looked at the manuscript, and I knew that giving it more time would be trading the possibility for minor improvements with the certainty of an increasingly difficult battle with The Enemy of Good. Here's the takeaway: You are a teacher, therefore, you are ambitious. You have great ideas — many of them. But you must pick and, at the end of the day, commit to getting ideas out the door consistently. If hard deadlines don't exist for any of the important things you want to try, impose them on yourself. Kindly, yet firmly. For that stuff that must get done — so last month, I had to give exams and get them graded before the cutoff date; I had to give those professional development workshops; I had to submit that Character Lab application — here are a few tips. First, produce a rough draft quickly. Days before the deadline, tell yourself, “Okay — let's say I fell into a time warp and the [speech, workshop, application, manuscript] is due tomorrow. I've got to have something.” I don't know if that helps you, but it's made a huge difference for me — especially with speaking engagements. This early completion allows you to tweak and improve a finished product — not a perfect one, but a finished one — during the final days before the deadline. Second, get it out the door. This means getting it done, attaching it to the email, and clicking send. For my workshops, it meant having everything ready and rehearsed when I showed up. Nothing I got done in January was perfect; everything, however, was of a quality that I know provided value to the intended audience. Here's the takeaway: Defy perfectionism — it seeks to enslave you. Get your work done and get it in front of the eyes that need to see it. 5. What's the smallest action that can move the project forward? Take it. If you've got a bigger project (for example, that Character Lab app last month was a big one for me), make progress on it even on crazy days by doing this: consider what is the tiniest step you can take to move the project forward, and then take that step. There were some days last month when my tiniest step was adding a sentence to my application, or revising five pages of Never Finished. Here's the takeaway: Done is better than perfect. A little bit done today means one step closer to completion. If you've been around for a bit, you know that front and center in my room is a sign that simply says “Do hard things.” That can't just be a slogan, though. Nothing is more painfully ironic to me than schools where the word “grit” is thrown at kids because it's an easy way of placing all the responsibility on them. When grit is something we expect only from our students, it's going to fail. A key piece of grit is “getting things done.” Another is doing things that challenge us — all of us. Here's the takeaway: We always ought to be doing something that challenges us — it need not be school-related, but it does need to exist. Generally, being awake is catabolic (breaks you down) and sleep is anabolic (builds you up). Sleep is known to be an elevated anabolic state, heightening the growth and rejuvenation of the immune, skeletal, and muscular systems. Basically, sleep rejuvenates you and keeps you youthful. I certainly got less sleep than I like this past month, but I would have gotten much less had I clung to the goals I set prior to January. Here's the takeaway: For some of you, sleep needs to be part of your professional development goals. That's right — if you're not getting adequate sleep each night, getting it needs to become an element of your “How I'm going to get better at teaching” plan. Seriously. Some of you tell me things like, “I'm up until midnight grading every night.” That is not sustainable. That is not a situation in which you need more grit; it's one in which you need more sleep. Get work out the door. Take at least a tiny step, every day. Hard things are good to do, even when circumstances make them harder. I appreciate you all. This month I'm planning to share some things I've been learning about the non-freaked out framework for literacy instruction, so stay tuned. Timely post here, my friend. So many of the hard working teachers I am coaching are having such a hard time focusing on what they have accomplished. Thank you for being real; real with your struggles, your advice, your success, and your passion. Sharing this one on “The Twitter” and by email to a couple of my fellow teachers who could use it. So glad to hear your wife is doing better. Blessed indeed! I completely agree Jennifer. I am also an Instructional Coach and while many of my peeps were able to see Dave speak in Turlock, CA this past Saturday, he didn’t talk a whole lot about this particular topic and the points made are exactly what could make or break some of them this quarter. Good luck with your teachers! It gives me goosebumps to see you two talking, Angela and Jennifer: high-powered coaches who empower those in their care. So glad to hear this is worth sharing; sometimes when I write this stuff I’m not sure if I’m just writing for me or if someone else will be able to benefit from it. So thank you! I think that is the beauty of having a blog, so many of your own thoughts, ideas, insecurities, and proud moments are processed and reflected upon in a much more thorough and action-filled way and by sharing it on a blog, you are bale to learn from, inspire, teach, and connect to countless others who share your same goals. Keep it up friend! Keepin’ it real, Dave. That’s what I love about your posts. Teachers so often need to be reminded of just what you shared. Thank you. I appreciate the wisdom of this so much. Definitely in survival mode this year. Focus on those small wins and those incremental improvements, Ginger. Thinking of you in the struggle. Honestly Dave, you are God inspired! Keep it up. Can’t wait until you come back to the Ohio area. We will meet one day! I’m presently trying to get the “okay” on missing school for a day to speak at OCTELA later this month, Kathy. Are you going to that? I am not a regular reader. You know, that Never Finished thing often prevents what I intend to do. But if I hadn’t known any better, I would say someone whispered in your ear what I have experienced in the last 6 weeks and you wrote this blog directly to me. It’s so rewarding to hear this, Jen! Thank you for giving me cause for gratitude. “We teachers are so good at so many things, except at times… finding the healthy balance in our own days.” Amen, Kathy. THANK YOU for sharing this, and for your prayers. They’ve been effective! As others have noted… timely thoughts. This portion of the year can pull people down. Stress is building up, testing is approaching, kids are…well… being kids. Thanks for the dose of advice, Dave. I was just speaking with a colleague today about that exact thing, Linda — it IS that time of year, isn’t it? Maybe not the place to post this but I pre-purchased your ebook but don’t know how to download it. Nothing came in my email to indicate it had been sent to me or I didn’t know what I was looking at and deleted the message. Could you please advise? Kay, this is a fine place! This has happened to a few folks. 1) I just re-sent you your receipt. It looks like you used a school email address; make sure you check that one. Within the email receipt you’ll see a link to download your book. 2) Check your spam. Some folks’ inboxes have been auto-sending the receipts into spam. 3) If these things fail, email me right away — dave_at_teachingthecore.com. Thank you for your support, Kay! Woah. Did I ever need to hear this? (Rhetorical question – the answer is a most decided “YES!”) Thank you for allowing your perceived imperfections to give us all permission to be perfectly imperfect! Good stuff! Thank you, Lynne! Keep up the work! Dave, Once you’ve lived in survival mode you can never go back to not knowing what it’s like. Your compassion for others grows like a lotus out of pile of dung. Exponential growth in compassion for others and the connections it engenders are the silverish lining to overpowering experiences that often derail normal life. Carefully, that growth in compassion can be turned toward oneself. Fill circle. Glad to have your insightful posts in my life. I haven’t read ‘never finished’ yet! It’s on deck! Thank you for writing it. Now that is what we call a metaphor! 🙂 Thank you, Msdayvt, for sharing this and for the generous encouragement toward my work! I have a way I keep things in perspective and try to share with teachers. I stole this from some unknown person who is way smarter than me. The 10-10-10 rule. Will this matter in 10 minutes? Will this matter in 10 months? Will this matter in 10 years? I love that, Shannon — thank you for sharing. Too often, it just won’t matter for long.